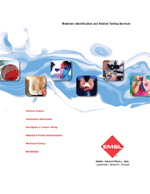 EMSL Analytical, Inc. provides one of the most comprehensive service offerings to help industry professionals identify – and eliminate – unwanted contaminants in their products. No matter what type of manufacturing process a client might use, there’s always concern that unwanted materials could enter into the manufacturing stream, and unfortunately, might make it into a final product. With the range of different manufacturing out there, the range of potential contaminant materials – and their relative impact – varies significantly. From tiny errant crystalline particles ruining yields in a semiconductor fab, to errant pigment agglomerates in a polymer packaging application, or unwanted organic by-products in a pharmaceutical API or food product – all of these issues are of concern to manufacturers and to consumers. EMSL has the scientific staff and equipment to tackle the equally diverse concerns our clients’ experience. EMSL offers analytical methods that span the range of possible materials. Using optical, electron, fluorescent, infrared spectroscopy (IR) and Raman spectroscopy, discrete contaminant inclusions can be detected, isolated and identified for elemental or molecular composition. Diffuse contaminants, such as unwanted side reaction products or degradation products, can be identified by using chemical separation and analysis methods – including LC/GC/MS, ICP and NMR. By contacting EMSL, you have the potential to harness a nationwide network of scientists, equipment and most importantly – experience – in a time and cost effective manner. Our staff has the experience and skill to serve as a partner for your manufacturing operations. When you need to understand the sources and nature of a contaminant issue, we can help you get the answers you need to improve quality and purity in your product offerings. Call or request a quote from our scientists today!